This entry was posted in Canada and tagged Canada Immigration Canada Jobs Canada Satrt-Up Visa economy of canada Jobs in Canada Migrate to Canada on July 10, 2013 by Blog Author. 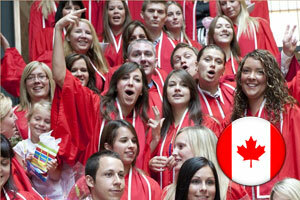 Dozens of students from different countries came to build their career and create a new life for themselves in Canada. Recently, the YWCA (Young Women's Christian Association) Hamilton’s Bridging to Employment program held its first graduation ceremony in Mohawk College, Canada, honouring 40 immigrants for completing one of the YWCA’s two programs – Bridging to Environment, and Bridging to Information and Communications Technology. The YWCA began Bridging to Employment in the year 2011. It is operated by a variety of partners including the YMCA of Hamilton/Burlington/Brantford, the ICT Sector Council, EcoCanada, Mohawk College, and the Council for Access to the Profession of Engineering. The programs bestow internationally trained professionals with courses designed to improve technical and non-technical skills in order to match the requirements and expectations of Canadian employers. The immigrant professionals will be given the opportunity to brush up on their “soft skills”; this will be useful for the Canadian workforce in their own field. This program had helped many students to create a remarkable career in their respective fields. Some of the students got the job in the most reputable companies bringing new hopes and challenges to improve their life in Canada. A new world was welcoming them, and intent them to work hard, and give their best to reach new heights of success.